In honor of 1,000 days in orbit, the NASA Lunar Reconnaissance Orbiter (LRO) team at NASA Goddard Space Flight Center in Greenbelt Md. has released two new videos. One video takes viewers through the moon's evolutionary history, and reveals how it came to appear the way it does today. Another video gives viewers a guided tour of prominent locations on the moon's surface, compiled by the spacecraft's observations of the moon. "Evolution of the Moon" explains why the moon did not always look like it does now. The moon likely started as a giant ball of magma formed from the remains of a collision by a Mars sized object with the Earth about four and a half billion years ago. After the magma cooled, the moon's crust formed. Then between 4.5 and 4.3 billion years ago, a giant object hit near the moon's South Pole, forming the South Pole-Aitken Basin, one of the two largest proven impact basins in the solar system. This marked the beginning of collisions that would cause large scale changes to the moon's surface, such as the formation of large basins. 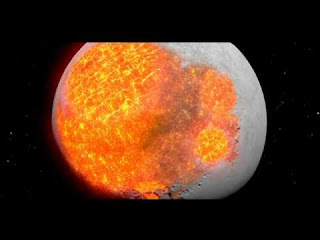 Because the moon had not entirely cooled on the inside, magma began to seep through cracks caused by impacts. Around one billion years ago, it's thought that volcanic activity ended on the near side of the moon as the last of the large impacts made their mark on the surface. The moon continued to be battered by smaller impacts. Some of the best-known impacts from this period include the Tycho, Copernicus, and Aristarchus craters. So, while the moon today may seem to be an unchanging world, its appearance is the result of billions of years of violent activity. "Tour of the Moon" takes viewers to several interesting locations on the moon. Tour stops included in this breathtaking journey across the moon's surface are: Orientale Basin, Shackleton crater, South Pole-Aitken Basin, Tycho crater, Aristarchus Plateau, Mare Serenitatis, Compton-Belkovich volcano, Jackson crater and Tsiolkovsky crater.